The most annoying thing about the vegetarians of yesteryear was definitely their insistence that Chk’n tastes just like chicken or that millet burgers with mashed lentils are just as juicy as real burgers. Luckily, todays vegetarians are finally telling it how it really is. Do meat-free versions of things taste like the real thing? Of course not, but they are DELICIOUS in their own right. As I’ve mentioned many times, I am an omnivore, but I try very hard to limit my meat consumption and eat plenty of vegetarian meals and this is one of my favorites. 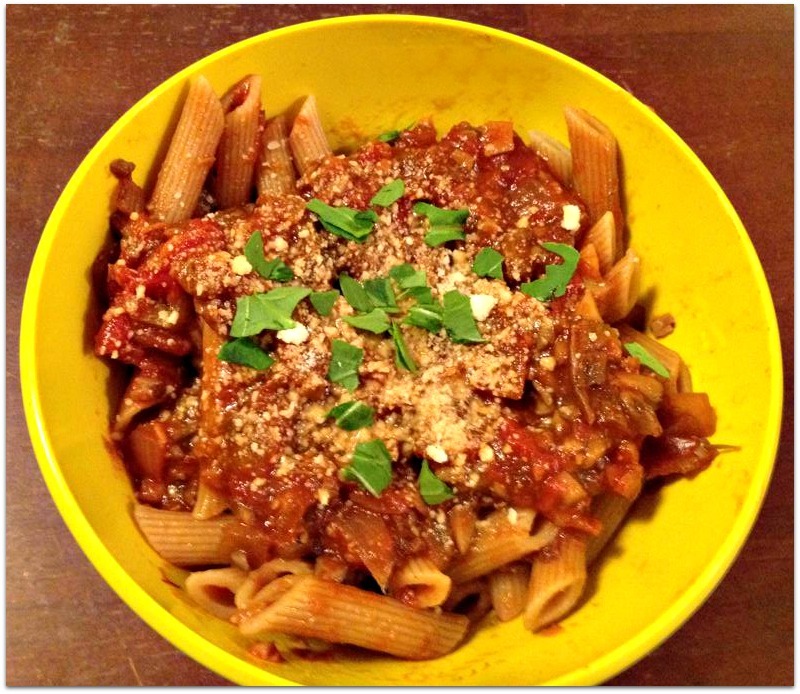 This recipe is a combination of a recipe from The Italian Dish as well as one from Mark Bittman. Combine Porcini mushrooms and boiling water in a bowl; cover and let stand 20 minutes or until soft. Drain porcini in a colander lined with a paper towel over a bowl, reserving liquid. Rinse and chop porcini. Add mushrooms, remaining 1/4 teaspoon salt, and a little more salt and pepper; cook, stirring occasionally until mushrooms are softened, about 10 minutes. Add porcini; cook 1 minute. Add tomato paste; cook 2 minutes, stirring constantly and scraping pan to loosen browned bits. Add reserved porcini liquid, wine, vegetable broth, oregano, thyme and bay leaves. Reduce heat; simmer 35 minutes, stirring occasionally and breaking up tomatoes as necessary. Stir in milk; cook 2 minutes. Remove bay leaves, serve over whole wheat pasta with plenty of grated parmesan cheese. Make sure to chop the mushrooms fine (and roughly) which will mimic the texture of ground beef or pork. I realize that Porcini’s are very expensive, but if at all possible I’d encourage you to not omit them. Along with their broth they give a rich, earthy flavor to this recipe. Though I think the addition of milk at the end adds a bit more richness, it, along with the cheese, could easily be left out to make this recipe vegan. For the last several weeks rhubarb has been back in full force at the Farmer’s Market. When you think of rhubarb you generally think of strawberries which is natural since strawberries and rhubarb are like the Khloe and Lamar of food- just so darn good together! 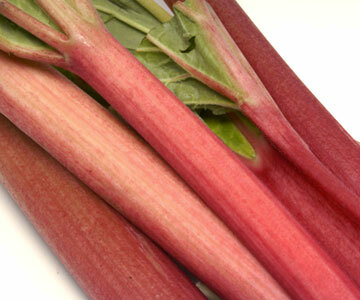 Rhubarb is, however, a vegetable and it works great in savory dishes too. 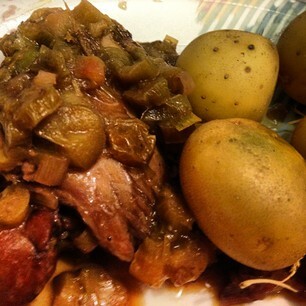 I found a recipe for braised chicken thighs with rhubarb over at chow.com. It looked great, but I decided to just use it as my inspiration and then heavily adapted it to my liking and it turned out great. I’d imagine this would work great with pork too so maybe next time I’ll give that a try. Ideally this recipe would use shallots, but since I had a leek left over from my salmon soup I just used that. Other than that the only modification I’d make next time is to heavier on the black pepper for a little more zip. Heat the oil in dutch oven over medium-high heat. Sear chicken thighs skin down until golden brown about 8 minutes, working in batches if necessary. Transfer the thighs to a plate. Add the shallots, ginger, cinnamon and cloves, season with salt and pepper, and sauté until the shallots soften, about 2-3 minutes. Pour in the wine, juice, honey, and water and stir, scraping the bottom of the pot to release any browned bits. Bring to a gentle boil and reduce the liquid by half. Return the chicken pieces and any accumulated juices to the pot. Add raisins. Place the pot in the oven and cook for 40 minutes until chicken is cooked through. Remove from the oven, add the rhubarb pieces, cover, and return the pot to the oven until the rhubarb is fork tender, about 10 minutes more. Remove chicken, discard skin and bones, shred meat and add back into sauce. I’m a big believer in knowing what I put into my body. It is not just that I want a choice, or my belief that I have right to make such a decision: it is spiritual. Yup, spiritual. This body, I’ve got just one. It won’t last forever. Therefore, I want the assurance of what I choose to eat, consume, or slather on- is safe. So the Rangers beat the Caps and are now in the Eastern Conference Finals, the final step before the Stanley Cup! Woo-hoo! If this was football and we were watching th Super Bowl, I’d make my Game Day Chicken Quesadillas, but because Hockey has a championship decided by a series rather than a single game I don’t really have an occasion to cook . I am still making a quesadilla this week however, but it’s a veryvery different kind of quesadilla. In this country we associate quesadillas with the Mexican version; a flour tortilla stuffed with melted cheese and a variety of other meats and veggies. The literal translation of the word quesadilla though, is actually “cheese thing,” and throughout much of Central America, including Guatemala, a quesadilla is a type of cake with cheese in the batter. 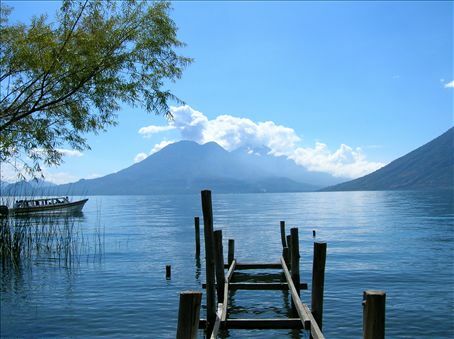 Guatemala is a country that I’m sure I’ll visit one day. 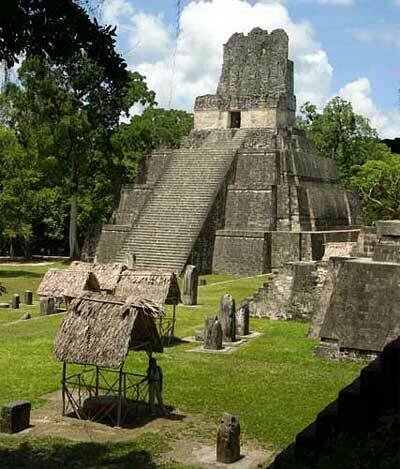 My good friend Hans (of favorite cakes list fame) is from Guatemala and I’ve already informed him that he has to take me there. His family still lives there and his parents love me… well ok they only met me the one time and probably don’t remember me, but once they meet me again they’ll surely realize that they love me and be thrilled to have me staying with them, right? As a thank you I can even whip this cake up for them. 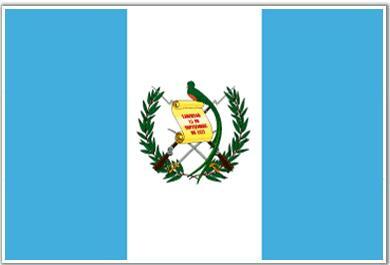 Guatemalan Quesadilla is made using Queso Seco or Cotija cheese which is a dry crumbly Mexican cheese. Because I live in a city where I can get pretty much anything, I had no problem getting the Cotija, but if you can’t find any where you live the good people of the internet suggest using 2 parts grated parmesan and 1 part crumbled feta instead. The cheese, which is crazy good and addictive, does have a similarity to both of those cheeses, but also has this bit of sweetness to it. I would make every effort to find the Cotija before resorting to the parm/feta mix. 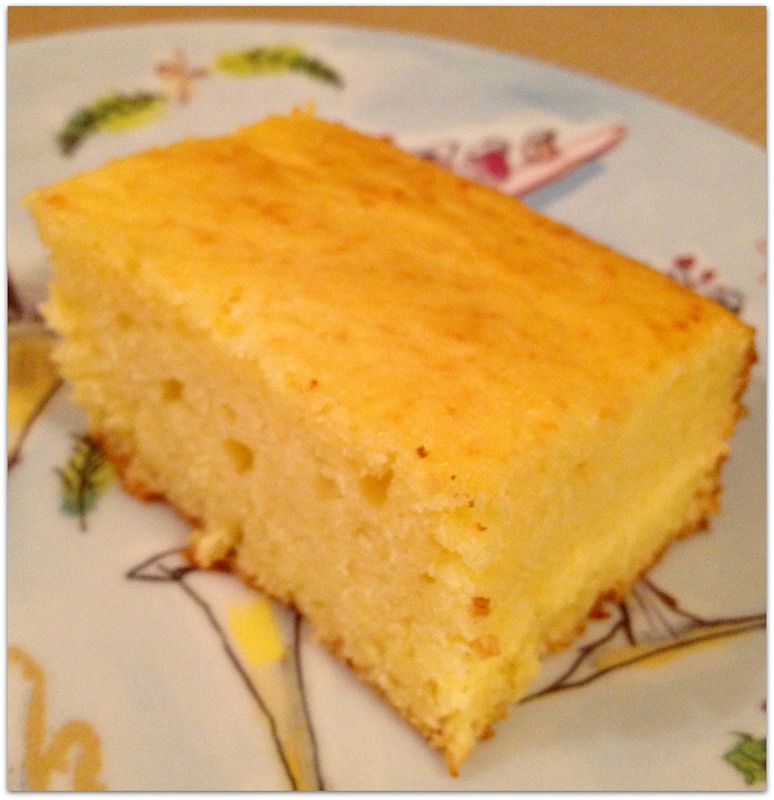 I also found in my research that this cake is just as often made with rice flour as it is with wheat. Two out of the five people who actually read this blog (I’m talking to you Erin and Lisa) are gluten free, but I have no other need for rice flour so I made the wheat flour version. If you try this with rice flour, my research suggests you use 1 3/4 cups rice flour in place of the 2 cups of wheat flour and you MUST tell me how it turns out. Usually sesame seeds are scattered on top of this cake, but I’m seriously allergic to sesame so obviously a no-go. Other than that I believe this is a very authentic recipe. Preaheat oven to 350 degrees. Lightly butter a 9×13 baking dish. Cream together butter and sugar on medium speed until light and fluffy. Add eggs one at a time, beating after each addition. Stir in milk and sour cream. Sift flour, baking powder and salt together over the wet mixture. Stir just until incorporated, do not over mix. Fold in cheese. OMG this cake is so so good. I am not big on sweet, gooey, frosting heavy desserts; preferring a plainer coffee style cake and that’s exactly what this is. This cake is perfect for a cup of tea (or coffee if you’re a coffee drinker). It’s the type of thing that I could see bringing to a book club or some other afternoon activity that involves people chatting and drinking hot beverages (clearly I’ve never been to a book club). The texture of this cake is hard to explain. 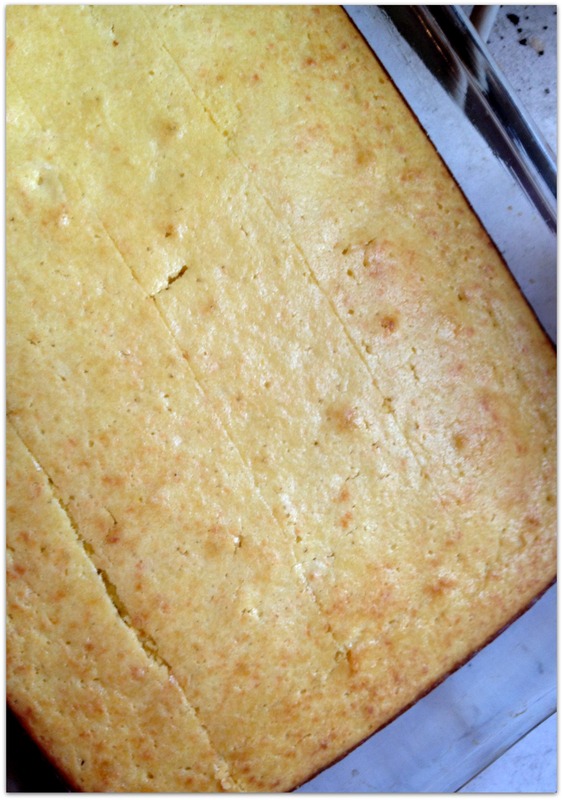 There’s a bit of texture from the cheese, though you’d never know there was cheese in it if someone didn’t tell you, which gives it a vague resemblance to corn bread yet it is super moist and buttery. I will definitely be making this again at some point. Greek food how I love you, let me count the ways. I love you for your tomatoes and your olives; I love you for your feta and I love you for your lamb and seafood. 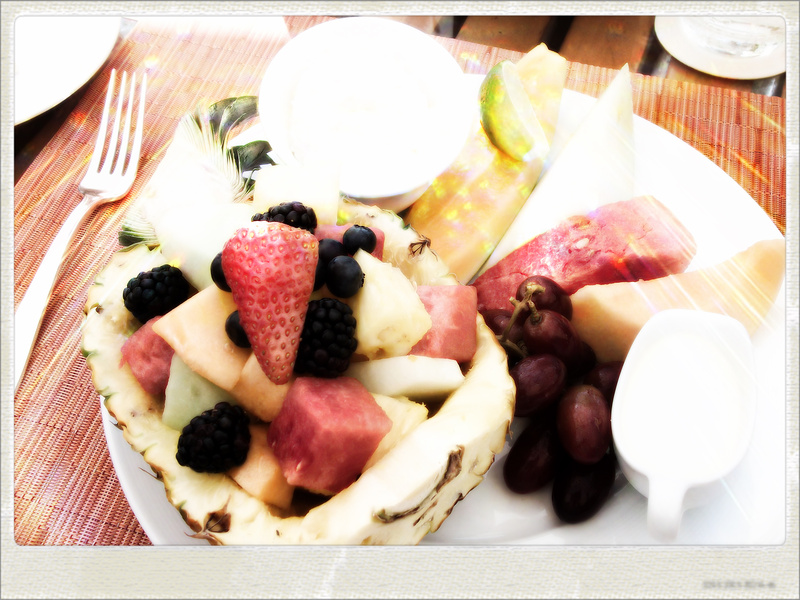 So many of my favorite foods so often incorporated in to your dishes, how could I not love you? We do Mother’s Day dinner on Saturday night instead of brunch on Sunday at a restaurant of her choosing. This year she chose Restaurant Loi, which we’d been talking about trying for a while. Maria Loi, chef and owner of Loi, is considered the Martha Stewart of Greece having a successful television show and many cookbooks. About a year and a half ago Maria decided to take on the big apple and opened a restaurant two blocks from my apartment – score! I called ahead, as always, to let the restaurant know about my food allergies. The hostess who answered had several food allergies herself. We joked that we should compete to see who has more and she assured me she’d make sure the chef and waiter knew. This is exactly how every hostess should deal with calls about food allergies; take it seriously, but be warm and put me at ease. When we arrived at the restaurant and checked in the hostess informed me that she was the person I’d spoken to and I’d be well taken care of. 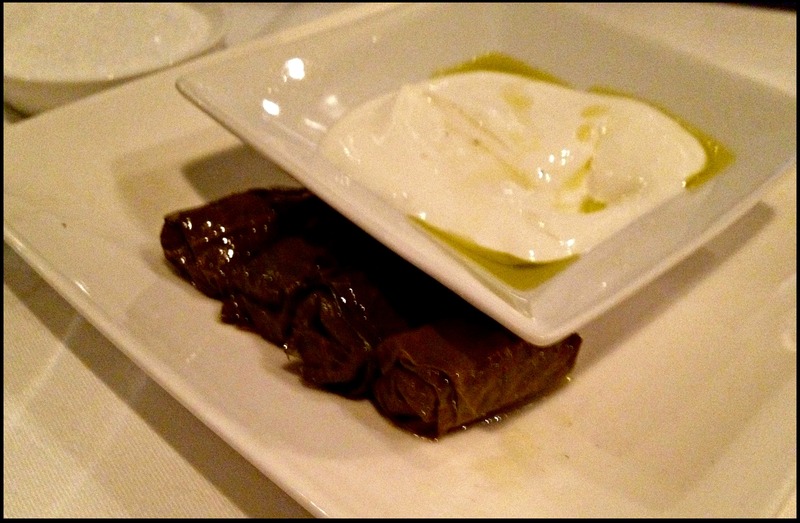 As an amuse bouche we were served Maria’s award winning stuffed grape leaves with yogurt dipping sauce. The amuse bouche and the complimentary bread are usually where restaurants fail on food allergic dinners. As is common, the amuse and bread were put on the table without anyone reassuring me that they were safe for me. I could’ve asked our waiter to check, but I didn’t bother. My parents said these were amazing though. 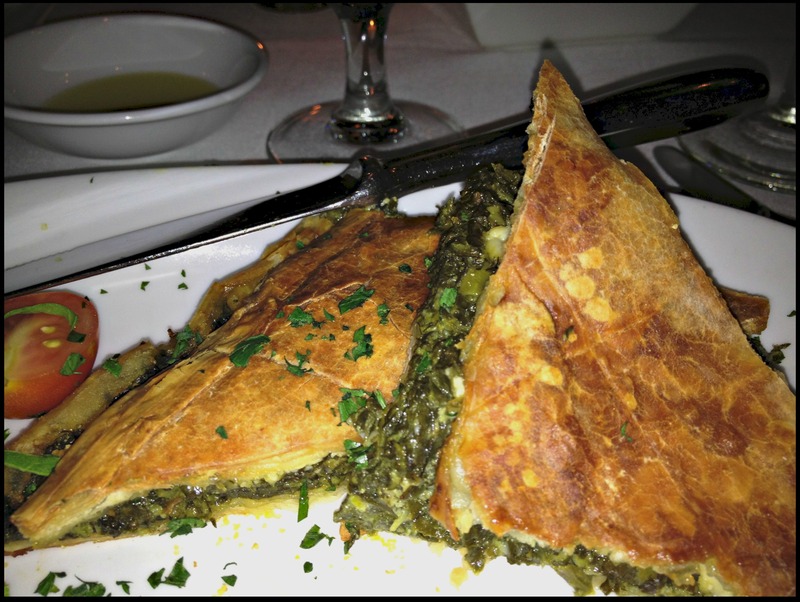 For my appetizer I had the Spanakopita, spinach pie, which is one of my favorite Greek dishes. It was probably the best Spanikopita I’ve ever had between the perfectly crisp , buttery phylo and the soft, flavorful spinach and feta filling. I could’ve eaten a pan of this. My mom raved about her Phylo Wrapped Shrimp with Pomegranate Sauce and my dad loved his baked Gigante Beans. 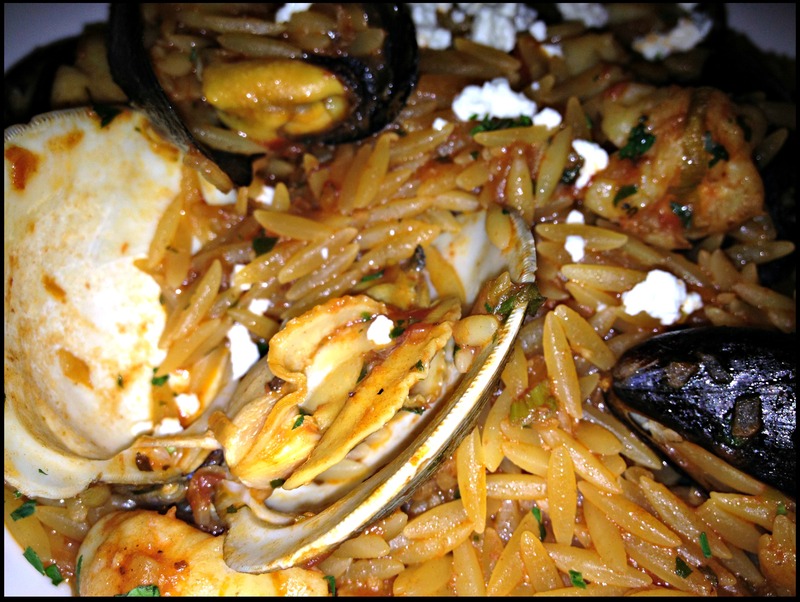 Since I’d started out with one of my Greek favorites, I decided to continue the theme and my dad and I both order one of my go-to Greek dishes, Seafood Orzo. Again, this was probably the best version of this dish I’ve ever had. It was a mor subtle and refined version of a Greek comfort food classic. The spices were slightly differnt and so delicious and all of the seafood was super fresh and perfectly cooked. My dad loved his too and my mom said her Lamb with Lemon Potatoes was fantastic. When it was time for dessert the waiter told me that the kitchen thought the flourless chocolate cake would be the only dessert safe for me. I really don’t like flourless chocolate cake (way too chocolatey for someone like me who isn’t a big chocolate eater) and I was stuffed already so I just had a cup of tea. The service was lovely and showed true Greek hospitality (most of the staff is in fact Greek) and the best part is that at some point in the night Maria Loi herself came out of the kitchen to greet each table. I had met her once before when I had a drink at the bar and both times I was struck by how warm and accessible she is. I will definitely be returning to Loi! Overall rating: Made me want to lick my plate in public! Are you familiar with the term hydraulic-fracturing, better known as fracking? If you’re not from an area where the practice is happening (or in imminent danger of it happening) probably not. If you like your drinking water though, you should be. Basically a company comes in to your neighborhood with the promise of getting natural gas from deep in the ground, pumps dangerous chemicals in to the water supply which then contaminate your water supply. Those chemicals also contaminate your food and beer because you can’t grow food or make beer without water! Because of this a number of chefs, including my man Mario Batali) and brewers have become vocal critics of the practice. Last week I attended a fantastic event called Save Our Beer. 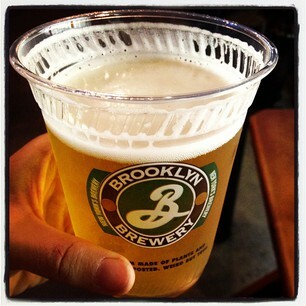 The event was hosted by Environmental Advocates of New York, New York Water Rangers and other concerned groups at Brooklyn Brewery. It was both informative and great fun. I love my beer. Seriously, beer and wine are two of the few things that I love as much as food. I’m blessed to live in a state where I have an abundance of amazing local food and lots of amazing breweries and I don’t want that to change any time soon. I don’t want those chemicals in my beer or my food and I certainly don’t want them in my body! If you love your beer as much as I do, or at least your food and water, contact your legislators demand higher standards in the natural gas industry and let them know that you will not be fracked with! To learn more here’s a recent piece from 60 Minutes I’d suggest watching.